Ginger and Spice make me Nice! Warm spices add more than just sensual spice to the season, they are actually healing, especially if you suffer from inflammatory issues like I do. I’ve always enjoyed Ginger, my favorite is the Japanese thin sliced sweet pickled ginger. Chewable ginger tablets can also be helpful for stomach upset. A few months ago I read that ginger may help reduce inflammation so that news gave me all the more reason to love eating it. It can be used for pain relief from arthritis or muscle soreness, menstrual pain, upper respiratory tract infections, cough, and bronchitis, chest pain, and low back pain. Inflammation in the hands, knees and lower back are my chronic issues but in winter it’s good to be prepared for respiratory infections. Raw! That’s the best way. Ouch, you might say, but I’ve found an ideal way. Turmeric is also well known for strong anti-inflammatory properties. I love curry and some curries use both ginger and turmeric, but I don’t eat curry every day (although I wouldn’t mind). 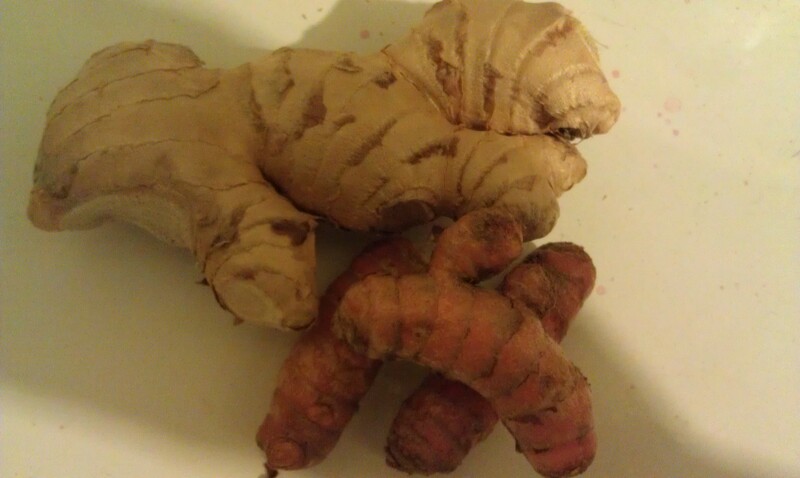 Besides that, ginger and turmeric are more powerful raw and in frequent small doses, such as several times a day. 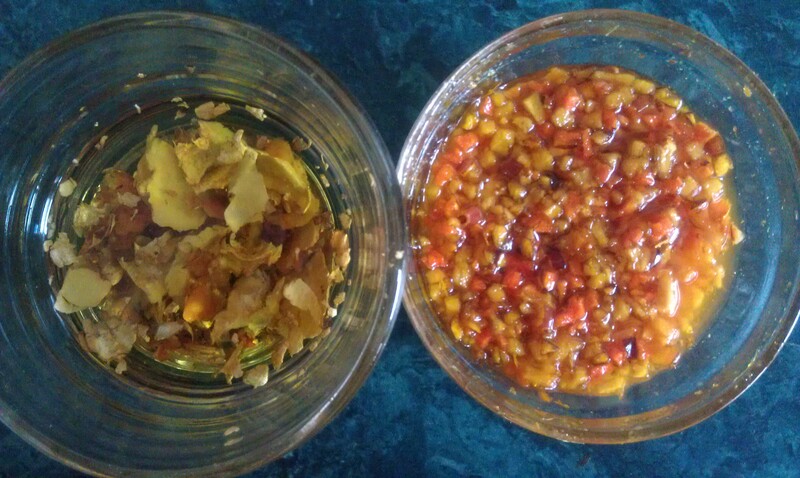 Turmeric and Ginger can both be chopped up in to very small pieces, similar to how you might chop up garlic (bowl on the right). I mix the chopped roots together in a small bowl and cover them with honey, just enough to make it sticky not soupey. This can be eaten several times a day as a crunchy, chewy snack – 1/2 teaspoon at a time. A consistent intake of raw ginger and turmeric 3 to 4 times a day, every day, really does reduce inflammation, plus it’s tasty! Another way to increase your intake of these spices is to use a peeler to slice them into a bowl (left photo) and cover them with olive oil. After a few days you can use the oil for cooking. There is no need to throw away the peels with these roots, just chop or slice with the peels on and use them whole.